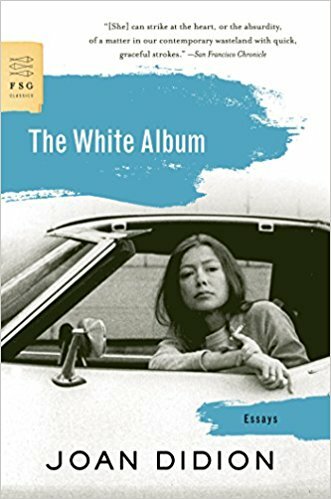 The essays in this collection range over diverse subjects, but as a whole are concerned with American culture, and the Sixties (as Didion capitalizes). Frequent topics include travel, especially air travel, and crime. She always pays close attention to place. Some essays have aged better than others, but all display Didion’s close focus, instinct for detail, and precise syntax. She also has a knack for surprising endings; it would be interesting to study her for her endings alone. I think she’s very good at time and place, that is, setting us in a recognizable time and place with cultural markers. (This may be an unexpected comparison, but she reminds me of Stephen King in this way: think about 11/22/63.) My advisor Kim points out that she uses clothing and architecture to great effect, and I think that’s part of it. I am especially interested in the title essay and “At the Dam.” “The White Album” begins with the memorable line, “We tell ourselves stories in order to live.” [Somewhere I have a list of such assertions–that narrative is life–and I think the late, great Brian Doyle figures heavily on it. I wish I had a transcript of an interview he gave onstage for a certain radio show in Bellingham.] This segmented essay, in 37 pages and 15 numbered sections, ranges through the United States (and particularly California) of the Sixties, name-dropping if you will: Huey Newton, Jim Morrison, Janis Joplin, Charles Manson, and more, linking these cultural markers with Didion’s own personal experiences. “At the Dam” is a mere five paragraphs long, but offers an incisive study of a place, the Hoover Dam: its history, its engineering, its cultural relevance, its place in a larger physical and metaphysical world. It makes one of those surprising shifts in scope at the end that gives it a profundity, as if the Hoover Dam needed emphasis. I’ll be reading more Didion. She is an impressive and craft-y essayist, in that her work feels both crafted–put together–and naturally occurring. She is a master of detail and cultural markers. I’ve got a lot to learn from her, and she is an easy, enjoyable read, to boot. I’ve been searching for an essayist to read. Didion is a fine idea. Thanks. Googling ‘at the dam’ now. Wonderful, Jeff, I love to be of help. Thanks for letting me know! I’d love to have you come on back and tell me what you think, too. Damn (no pun intended). Didion got so much more out of her visit than I did. I’m certain this is a function of time. She saw the dam 48 years before I did. Its face no longer gleams, and we’ve become so accustomed to engineering feats that the dam got a ‘meh’ from my family. I think her essay shines most when she gets away from the dam and describes her surroundings in the southwest. She seems appropriately equally awestruck by the landscape and the wind as she is by the cement and steel. It’s was the natural environment that made us want to get off the dam and back to the desert. The bit about the Pepsi can is timeless. Can you recommend any WordPress blogs with exceptional storytelling and careful writing? Jeff, I’m so sorry that I’m replying to your post here with such a delay! I’ve been traveling and mostly out of cell (etc.) range. I appreciate your thoughtful response. I can only imagine the difference 48 years makes in how we view something like this. (I’ve never seen the Hoover Dam.) But of course Didion presumably has all kinds of machinery working when she has an experience she suspects may yield an essay; she’s got her observational parts high-tuned and knows how to turn them on to produce reflections like this on purpose, I expect. Does that make sense? Not to imply that your observational parts don’t work well! But that she’s a certain kind of creature. Because of your interest, my next post coming up on Wednesday (November 15) will be the craft annotation I wrote for school on “At the Dam.” This is the first time I publish one of these annotations; we’ll see what you think. As to your question about other WordPress blogs, I’m afraid I’m going to fail you completely there. I used to read lots of other blogs, years ago, when I first began this one and when I worked as a librarian. These days all my reading time is taken up with reading for school and I don’t really follow any other blogs at all. I’m sorry I can’t help. I think WordPress itself has a recommendation engine of sorts (an algorithm, I assume) but don’t know how good a job it does.